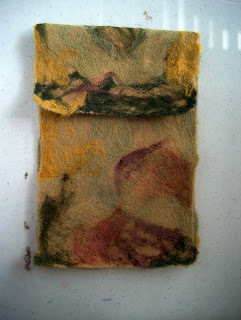 Here's the felted bag I mentioned, I need to sew the sides together and make the strap yet, it was needlefelted using the Janome Expression. The dealer down the street, from my shop, lent me the machine and if I wasn't in so much pain I'd make samples for them as well. Maybe next week sometime??? I have another bag done already and it's at the shop in the window display with a bunch of other felted items that is announcing our needlefelting workshop the end of October. Bottom to Top: Front view with the flap open, the back and the front views, and the front view with flap closed. The views are clipped a little bit but that's because I'm in so much pain I'm not able to stretch up enough to get a better view. I'm taking muscle relaxers and pain pills but it doesn't even tough the pain - which tells me it's in the bone not the muscles cause those muscle relaxers they gave me can drop a horse and I'm not whinnining yet! 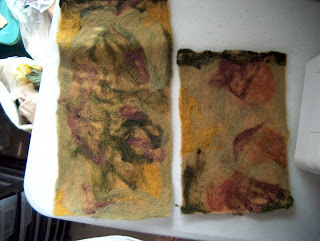 The background fabric is wool that has been dyed with natural dyes, and the wool on top is a combination of natural dyed and synthetically dyed fibers. 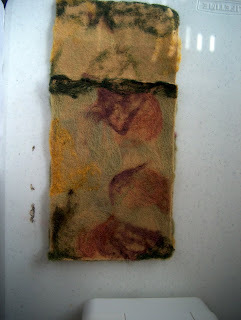 Note that it is nigh impossible to match natural dyed fibers to synthetically dyed ones.